Being a lover of pork products, I am always looking for great pork dishes on menus when I go out to eat. While I was in Italy, I tried one of their traditional dishes called porchetta or porketta and it was to die for. This is Italy’s version of roasted pork, that, in some regions is made during celebrations, and in other areas it is a part of their daily life. I cannot say it is my favorite way to eat pork because I love bacon so much but it is up there. 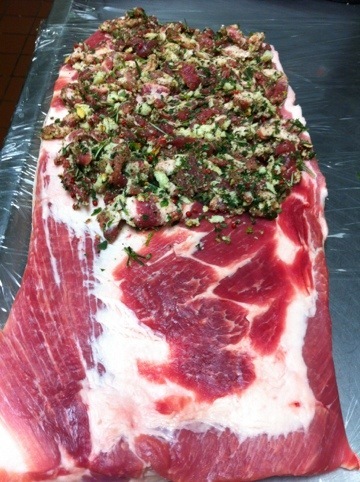 Porchetta can be made with multiple different cuts of meat, including the shoulder, belly, and loin. My favorite cut is belly because of the fat content and the ability to keep the pork very moist. The cooking process can take 5-6 hours but preparing the belly should only take 30 minutes. The recipe below uses a pork belly but may be substituted for shoulder or loin. When using another cut there will be a little more preparation involved, the pork will need to be cut and unrolled, whereas the belly only needs to be trimmed. Skin on is the best preparation but I took the skin off of mine for this post, the skin will help keep the moisture in, which I did not have a problem with. The choice of filling is entirely up to you and the recipe below is just an outline. 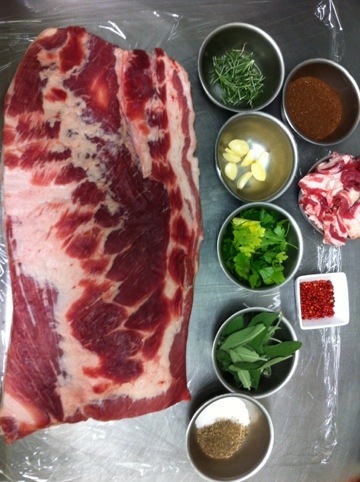 Lay the pork belly skin side down on the cutting board and trim all of the meat to make it an even width. Then trim the sides to make it a rectangle. Rough cut the bread into small dice sized pieces. Spread the meat mixture evenly on the flesh side of the belly and roll tightly. 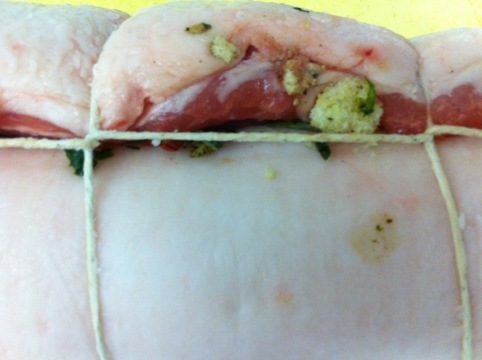 Tie the rolled pork with butchers twine to get it to hold. Before tying I found it easier to wrap it tightly with plastic then put it into the freezer for about an hour, this will get the pork to hold its shape, making it easier to tie. 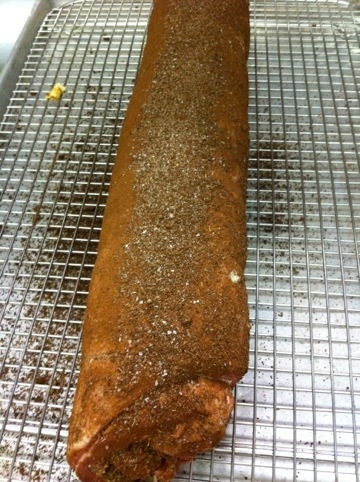 Season the rolled pork with enough olive oil to coat followed by the cocoa rub. Place the pork on a roasting rack, you may need to cut the pork into two pieces depending on the length of it, and place it in the oven. After two hours, dump the red wine over the belly. 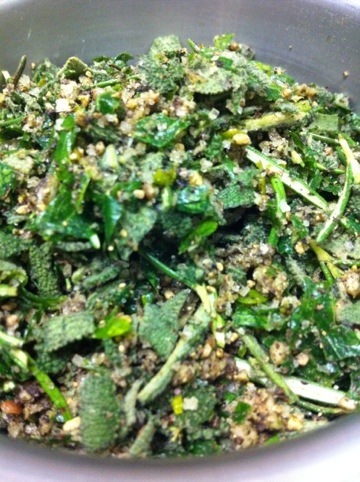 Once the pork has become spoon tender, meaning a spoon will easily penetrate the pork, it will be done. Remove it from the oven and baste. You can serve from here or place in the fridge and slice for sandwiches. 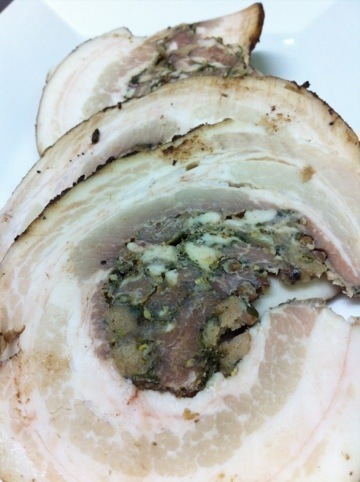 Cooked and sliced porchetta ready for a sandwich. The best part of using pork belly for porchetta is it tastes and cooks up just like bacon minus the smokiness! Tastes even better than it looks! I made a sandwich with some of it the other day, Amazing! How’s the skin? Does the long, slow cooking make it tender, or does it have a little “chew” to it? The skin is great, once we slow cook it we cool it and then slice it. When we reheat it we cook it in oil and crisp the skin up. If you are going to serve right from the oven then it would be good to get some oil to the smoke point and baste it over the skin to crisp it up.